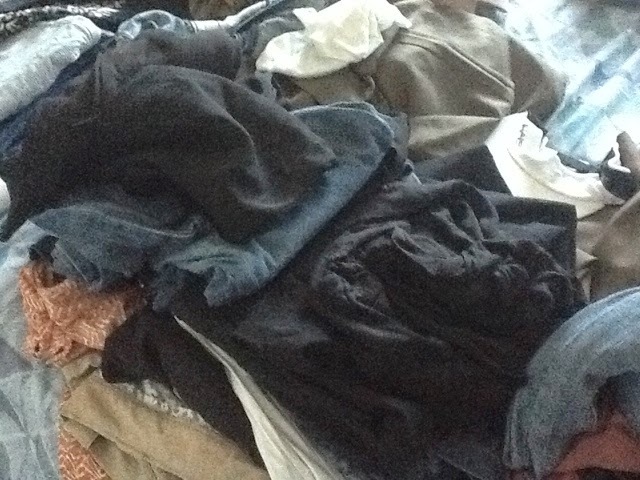 Order of the day: Closet clean-up! ~ Mommy Meowmeow! It must have been a year ago when I last wore my pre-baby jeans. Who knows whether dwarves actually adjusted my clothes to make them smaller?! Hahaha! I may not have birth-giving hips but I gained a lot too..so much that from a usual X-Small or Small shirt size, I'm now mostly Medium or even (gulp!) Large based from the size chart of most online stores I frequent. Besides, I think I'm already spending a lot on nursing/breastfeeding tops that it's not anymore justifiable to spend on new bottoms. Especially when di naman malaki ang diperensya. If I were my hubby, and for good measure, I'd tell myself to lose weight and tone up na lang so I can still use most of my old clothes :) healthy and fit mommy, healthy wallets..I say it's a win-win proposition! I'm also actually surprised to find some flirty skirts and dresses tucked in that drawer! Well just my luck as we have back-to-back parties to attend this June! And I'm already composing outfits in my mind. I just wish hubby would approve of me in them! Teehee!